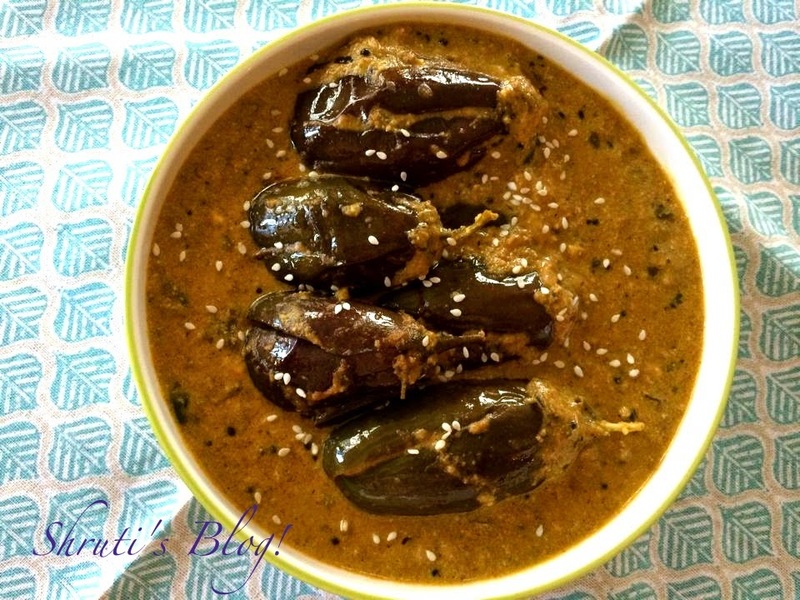 Being a Hyderabadi, I have a very complicated relationship with baingan (eggplant). For another, I subscribe to the word being put to great many uses in ‘dakkhani’ parlance to denote a wide spectrum of emotions - happiness, sadness, disappointment, anger, skepticism…and more. A "thali ka baingan" is a fence-sitter who will conveniently take sides, and a "kosar ka baingan" is person who is as useless as that freebie lone baingan that’s thrown in as goodwill upon a major purchase, while one can’t imagine anyone else but a windbag can carry the title "Bainganpalli ka Nawab". Things can get even more colourful. At the risk of sounding risqué, may I tell you that this word is used as a euphemism for a profanity? So you can actually and safely get to say cusswords, without which no Hyderabadi interlocution is complete. So you see how intrinsically this baingan is linked to a Hyderabadi’s life. Hyderabadis even have folksongs around baingans - "Kya pakai ge samdhana, chinta chigur baingana" pokes fun at the culinary skills and status of one’s in-laws who can afford to cook only baingan with tamarind leaves, instead of a rich meat dish. 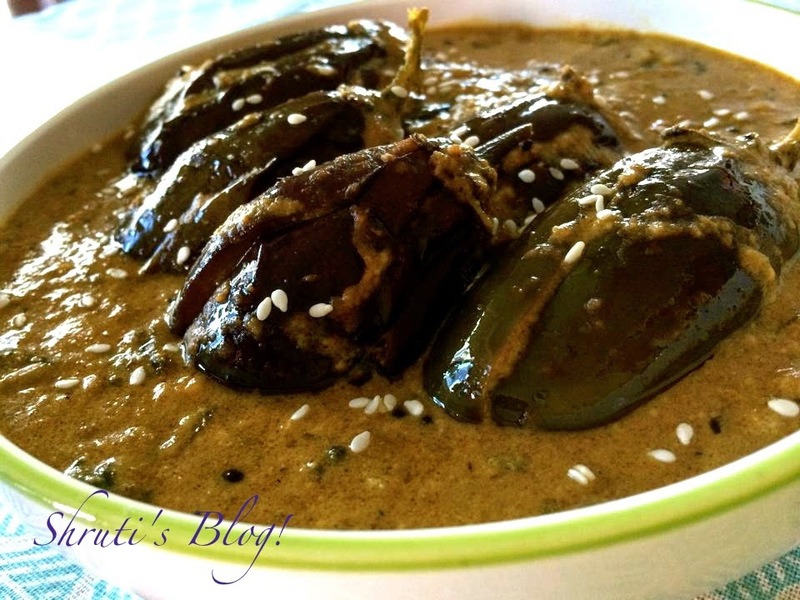 Hyderabadis cook baingan in so many different ways, the baghara baingan is only the tip of the bainganberg. Discovering, cooking, savouring and sharing these traditional baingan recipes, sometimes I worry that soon there will be no more to explore. 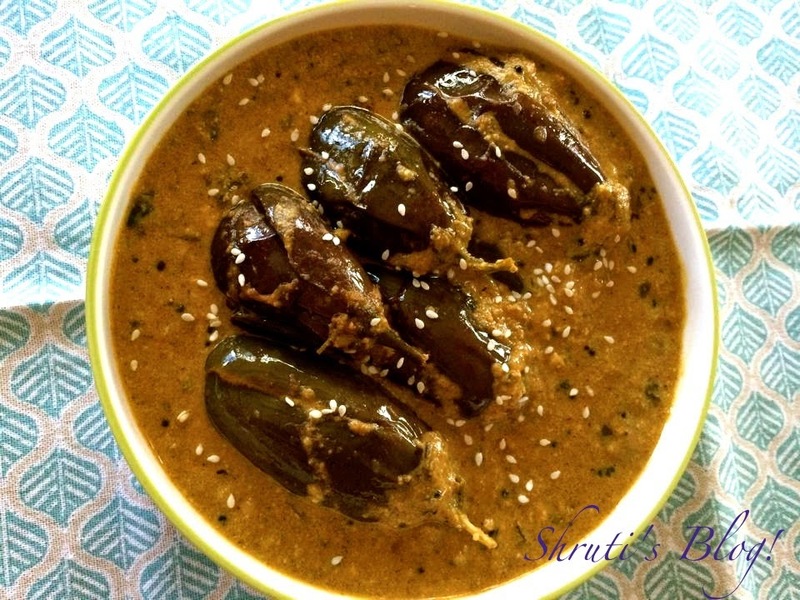 Just when I think there is can’t be another way to cook baingans, here comes a recipe that charms me out of my misapprehension. What more! It uses the ingredients I love- the seed and nut triumvirate and - kalonji! I must thank the quirky but talented Vah-Chef Sanjay Thumma for this inspiration. What struck me the most about Chef Thumma's recipe was the complete lack of use of any garam masala - yet the dish is so fragrant and rich! Dry roast the peanuts in a hot pan or kadhai. When almost done, add sesame seeds and the desiccated coconut and stir it continuously until the seeds puff up and the coconut begins to toast. Remove the roasted mixture into a blender, add a cup of water and grind it to a grainy paste. Clean and cut the eggplant into four, without cutting through, so the stem and the calyx hold the quarters together. Heat oil in the pan and fry the eggplants. Drain well and keep aside. In the same oil, add mustard seeds to splutter, followed by the dried red chilly and kalonji. Add sliced onions, salt, curry leaves. Cook the onions till golden in colour. Add ginger garlic paste and sauté for a minute or so. Then add the methi powder, turmeric, red chilly powder, cumin powder, coriander powder and chopped green chilly. Next add the peanut and sesame seed paste. Add enough water to thin the mixture. Cover and cook the mixture on a low heat for nearly half an hour or till the oil separates. You will need to check the level of water to maintain the consistency and stir the mixture from time to time to prevent burning. When the gravy is cooked well, add half of the chopped coriander, all of the chopped mint, the beaten yogurt and bring it back to the boil. Then add the fried eggplants and place a lid on the salan and let it simmer for a few minutes more. Garnish with the remaining coriander and serve hot with roti, jowar roti, rice or with the famous Hyderabadi biryani. "Kya pakai ge samdhana, chinta chigur baingana" is too good Di, will try this out soon. Sounds and looks delicious Shruti. You may want to edit to insert at which point you add the jaggery.